When Kaylee Cavanaugh screams, someone dies. So when teen pop star Eden croaks onstage and Kaylee doesn't wail, she knows something is dead wrong. She can't cry for someone who has no soul. The last thing Kaylee needs right now is to be skipping school, breaking her dad's ironclad curfew and putting her too-hot-to-be-real boyfriend's loyalty to the test. But starry-eyed teens are trading their souls: a flickering lifetime of fame and fortune in exchange for eternity in the Netherworld—a consequence they can't possibly understand. Kaylee can't let that happen, even if trying to save their souls means putting her own at risk…. 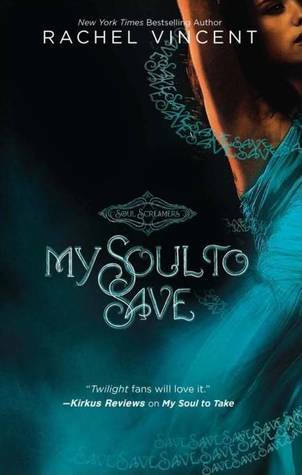 The first book in this series, My Soul to Take, was a favorite of mine when I read it, so I ordered the rest of the series, and then picked up this one some time later. In My Soul to Save, we see more of Todd, which I think added to the excitement of the story. Todd is a complex character that I could never really get a good grip on who he was, but that mystery is what makes him so appealing. Plus, he’s totally cute, y’know, for a dead guy who kills people for a living… or, death. As Nash’s brother, it also tells us about Nash’s personality to see how they interact with each other. I’m also actually a very strong shipper of Kaylee and Todd, but alas, such is not the way of the world. But in this novel, Todd does get some action. His ex-girlfriend, Addison Page, is a famous pop star. The problem? She was forced by Dekker Media (which is basically a thinly veiled disguise for Disney) to sell her soul to a demon for fame and fortune. Um… Hannah Montana anyone? I know she didn’t get famous by herself. I’m pretty sure this explains it all. Anyway, Addie and Todd still have some chemistry between them, and it was a little heartbreaking to see how much Todd cared for her, even though in the end he could do nothing to save her. Dekker Media was an entertainment titan. They had theme parks, production studios, television channels, and more large-scale marketing cloud than any other company in the world. Dekker Media had its sticky fingers in every pie imaginable. Kids grew up watching their movies, listening to their CDs, playing with their toys, wearing their officially licensed shoes and clothes, and sleeping between sheets plastered with the faces of their squeaky-clean, family friendly stars. Kaylee and Nash’s relationship is rising up a few notches. Not only are they fighting evil demons who devour people’s souls, but also their own rising sexual tension. They’re a close couple, and wherever Kaylee is, you’re sure to find Nash, and vice versa. I also saw Todd as an obstacle in their relationship, not so much in that it’s a love triangle, but that he was always interfering or popping in purposely at inopportune times. I’m very interested in seeing how much farther Kaylee and Nash’s relationship progresses after this book. Kaylee herself is my favorite character, because she’s actually handling everything the way I would. Actually she’s handling it much better. Her dad has just come back into her life and he’s trying way too hard. If I were her, I would have already burst out yelling profanities at him. But she somehow holds herself back and takes his feelings into consideration. She’s also dealing with the fact that she’s a bean sidhe (banshee) and learning how to master her wail so she won’t burst out shrieking every time someone dies near her. That’s a useful skill, I think. Overall, it was a good book, not as satisfying as the first book, but definitely s great installment. I really enjoyed the whole series and am now not-so-patiently awaiting book 5... I'm so glad to have found another Kaylee-Todd shipper!! Trust me, this feeling will only get worse in the next couple of books. I hope they do end up together somehow. Hope you enjoy the next books as well :) I liked the fourth one better than the third.